﻿PLEASE JOIN US IN HONORING THOSE WHO HAVE SERVED. ​DO YOU HAVE A FRIEND OR RELATIVE WHO SERVED DURING WWII AND WOULD LIKE TO TELL THEIR STORY? We will post their stories and pictures to honor their service and ensure their contributions are not forgotten. It is estimated that there are fewer than 600,000 WWII veterans surviving today, and we are losing approximately 350 per day from the "Greatest Generation". Help us preserve the memory of their contributions! 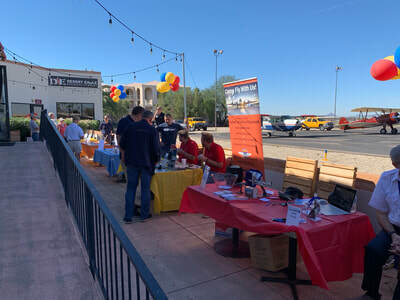 Warbirds Unlimited Foundation is a 501c(3) non-profit organization composed of dedicated and interested persons who voluntarily work for the success of the Foundation. We seek to acquire military Heritage aircraft of WW II for restoration to static and flight status and maintain them in pristine condition for the education and enjoyment of the general public and aviation enthusiasts. ​ Warbirds Unlimited President and Executive Director Receive FAA Master Pilot Award! Warbirds Unlimited Foundation congratulates its President Ray Hillson and Executive Director Jack Fedor on their recognition by the FAA as Master Pilots. The award is the most prestigious award issued by the Federal Aviation Administration to pilots and recognizes Ray and Jack's 50+ years of contributions to aviation. We thank you for your many contributions to aviation, Warbirds Unlimited Foundation and our American Aviation Heritage. Warbirds Unlimited proudly supported the Historic Photo Dedication at Mesa Falcon Field Airport February 25, 2019! See pics below. 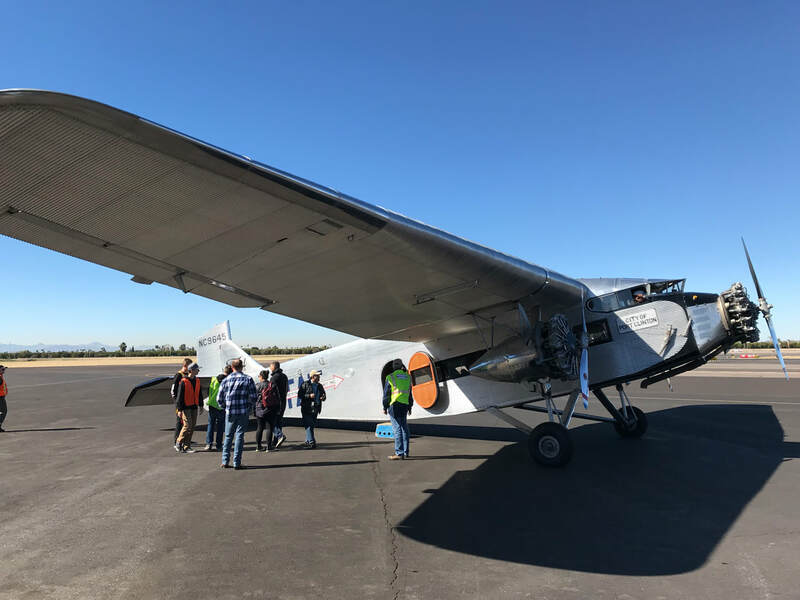 Warbirds Unlimited supported the recent tour stop of the Experimental Aircraft Association Ford Tri-motor at Mesa Falcon Field on January 24-27, 2019. 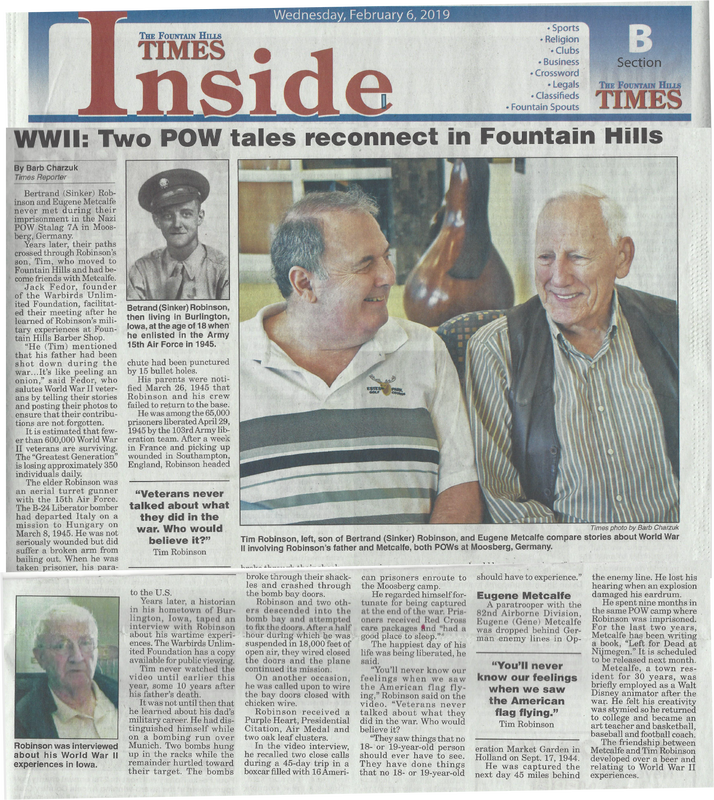 Visit our Honor Roll for our latest addition and listen to the interview of "Sinker" Robinson, a B24 gunner shot down over Yugoslavia in March 1945. 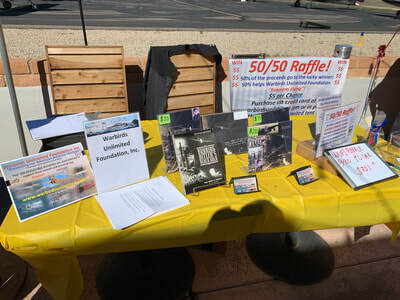 December 7, 2018: Warbirds Unlimited 50/50 Raffle #3 is complete and the winner is ticket 0603015 held by Jack F. The pot of $1505 is split between Jack F. and Warbirds Unlimited. ​A sincere Thank You to everyone who participated in raffle #3 to "keep em flying". 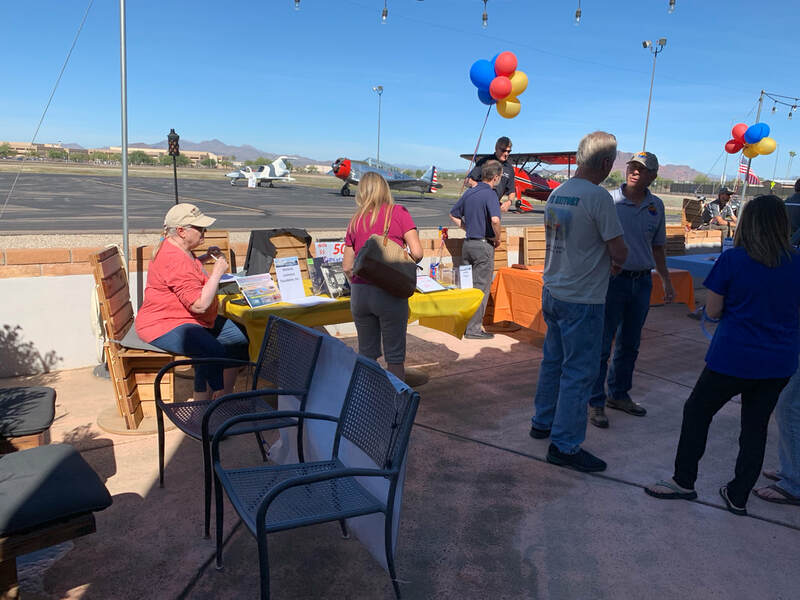 November 3, 2018: Thanks to all who visited with Warbirds Unlimited during the Mesa Falcon Field Airport Tennants and Family BBQ. Good luck to those that bought 50/50 raffle tickets. The drawing for raffle #3 was held December 7, 2018!. It is with great sadness that Warbirds Unlimited learned of the passing of Lynn Davis. 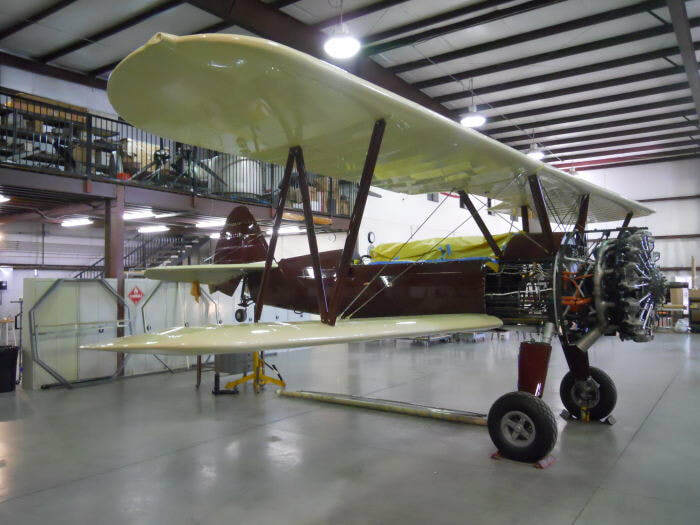 Lynn was the lead restorer on Warbirds Unlimited' s AN75-N1 Stearman. God Speed Lynn Davis, we are grateful to you for your friendship and expertise. You will be greatly missed. Below: Dr. Mike Pfleger of Warbirds Unlimited seated in a P-40 Warhawk; ready for a flight with Warbirds Adventures of Florida. Warbirds Unlimited was represented at the 2018 Reno Air Races! Our classic AT6-C participated in the T6 event as racer #54 "Miss Informed". Follow our journey to Reno through our photos and videos on our "Miss Informed" web page! The below links are provided for further information on the 2018 Reno Air Races! Warbirds Unlimited AT-6C was flown by experienced Reno air racer Mike Pfleger. Mike also flew a P-51 in the Unlimited Category. 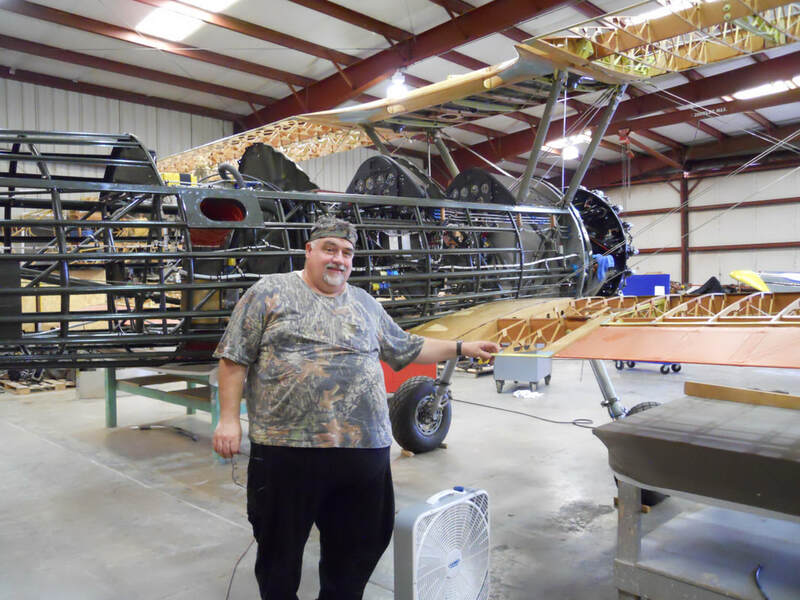 Warbirds Unlimited welcomes Dr. Mike Pfleger to the foundation. Mike will be piloting the Warbirds Unlimited AT-6C in the Reno Championship Air Races. Mike Pfleger has enjoyed the thrills of flying some of the USA’s most iconic military aircraft: trainers such as the Boeing Stearman and North American T-6 Texan, fighters such as the P-51 Mustang, F4U Corsair and FM-2 Wildcat, and jets such as the T-33, F-86 Sabre and the Russian MiG-15. Pfleger’s love of flying began when his father, a former pilot, took him as a kid to watch planes at the airport and taught him to draw them and build plastic and balsa-wood models. 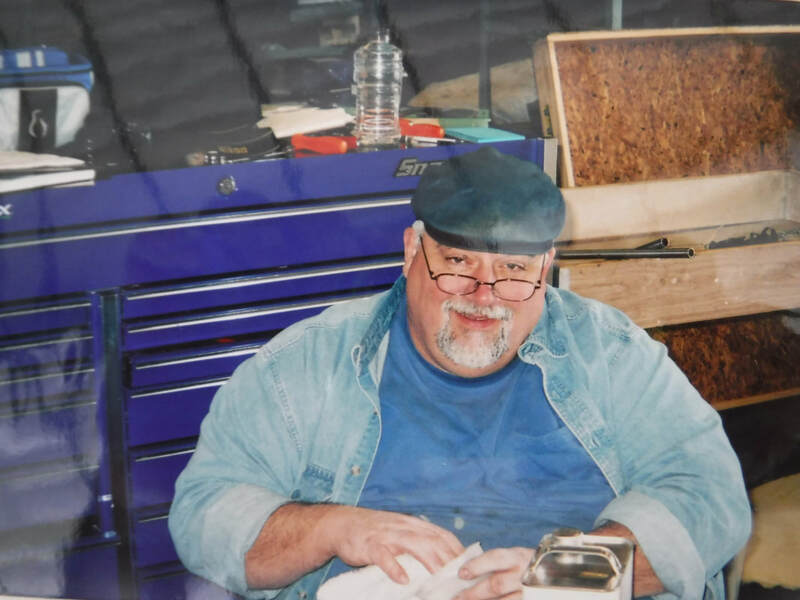 As he got older, Mike rode his bicycle and later his motorbike to local airports in Tulsa, Okla to hang around restoration shops where WWII planes and early jets were being reborn. He learned all he could about flying and obtained his private plot license in gliders at age 16. FAA vision requirements at the time didn’t allow him to pursue a military or airline pilot career, so after high school Pfleger earned a bachelor’s in mechanical and aerospace engineering at Oklahoma State University before working as a performance/flight test engineer at GE Aircraft Engines in Cincinnati. 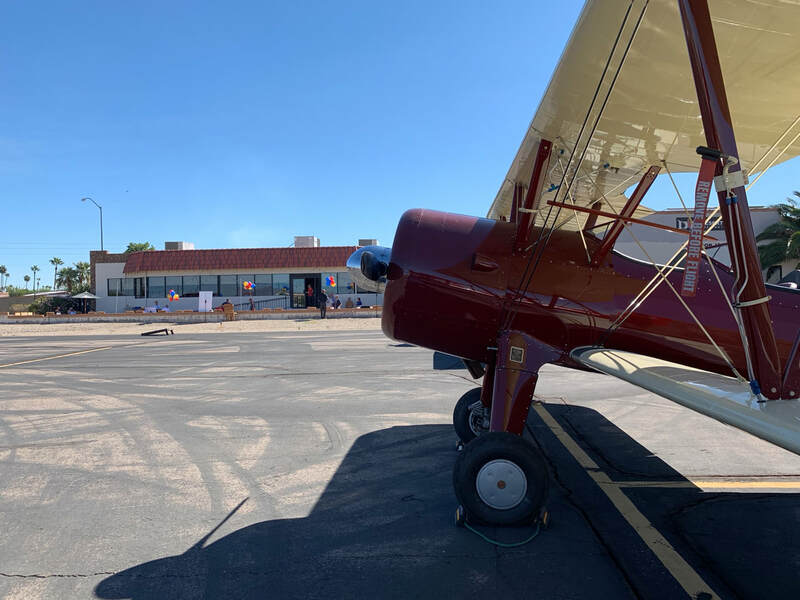 He continued flying, racing and towing gliders and enjoying tailwheel classics like the J-3 Cub, Cessna L-19 and Piper Pawnee. Pfleger also learned basic aerobatics in planes like the Bellanca Citabria and Decathlon. It was a flying club member who was an ER physician who interested him in a career in medicine. Pfleger attended the University of Cincinnati Medical School, and his residency in emergency medicine brought him to Phoenix, where he has put down roots. After the medical school bills were paid off, he was able to purchase a North American T-6 in which he accumulated more than 900 hours through formation flying, aerobatics and racing at Reno." Warbirds Unlimited recently added a 1946 North American Navion to its fleet of historic aircraft. ​Although originally designed for the post WWII civilian market, Navion's served with the US Army Air Force designated as L-17. Warbirds Unlimited demonstrate our American aviation heritage in our World War II Trainers!